I am not sure what the differences are and the Pros and Cons of either. But, we need a new propane grill, looking at the double deck ones from Magna. Haven't you ever sat around a wood fire and felt the heat on the side facing the fire? That's the IR radiation component of the heating. Propane just another fuel. Ever seen a " heat lamp" again heats the surface it shines on via radiation not convection. In that case the fuel (source) is electricity. 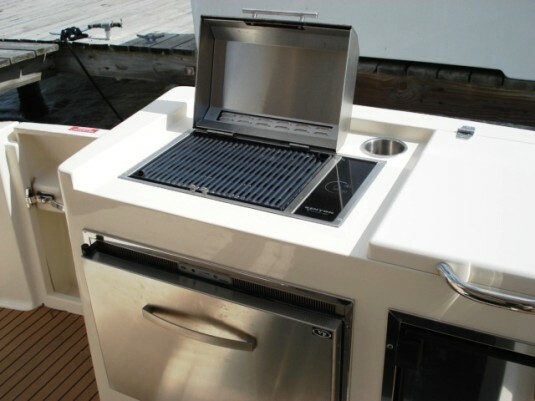 Wonder if they are still considered open flame grills per marina regulations? Would be nice to grill in Marina's, can't believe how many break the rules though. Same here. Could never easily tell if the thing was lit, constant regulator problems, hard to clean... A flimsy tabletop grill for $29 at Walmart was far less of a hassle. One quarter of the area of my home gas grill is infrared, and I use it for searing, but the head is too intense for cooking thick cuts all the way through. It is analogous to the broiler function of a typical oven. So, unless you want to severely limit what you can cook (or rely on sous vide, but even then . . .), IMO you will need both to cover all of your bases. I guess that not all infrared grills are the same? My previous home grill was a Char-Broil infrared grill. Always had a devil a time trying to keep it clean. The tiny slots in the heating plate would always clog up with grease, as they were not big enough for the grease to fall through. When it was time to replace my grill, last year, I went old school, without infrared and am much happier with the results. I have an IR grille on our boat and like it a lot. It heats up very quickly and cooks quickly if you want to (saves propane). You can also turn it down and cook slowly. I wouldn’t try a roast or something that took hours because I don’t know if it would go that low. I wouldn’t do that on the boat anyway because it burns through propane. This is the first one I’ve had and I really like it for the boat. We grill frequently so it matters to us. Have had a Magna Newport IR for a year. No problems. Meats and other Grilled foods retain their moistness.Wife loves it - so that’s all that actually matters. I like the rod holder adapter so that I store the grille below, off the transom ( less likely to walk away, and no impediment to dock lines).